March 2015 ~ Eat. Run. Rehabilitate. Greetings Readers! I am excited to share some new and important research with all of you. The Journal of Athletic Training (JAT) released a new study for early publication on March 20th, 2015 titled Development and Validation of the Athlete Fear Avoidance Questionnaire by Geoffrey Dover, PhD, CAT(C), ATC and Vanessa Amar, MSc, CAT(C) from Concordia University in Montreal, Quebec, Canada. What is this and Why is it exciting? 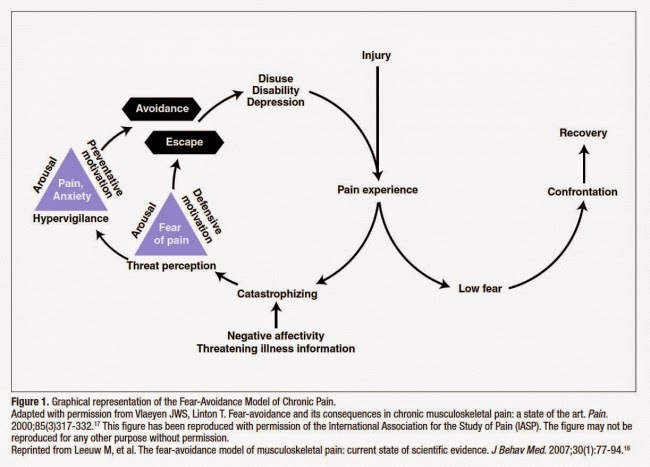 The fear avoidance model and specifically tools like the Fear Avoidance Belief Questionnaire (aka the FABQ and it's derivatives) as well as the Pain Catastrophizing Scale (PCS) have been vital assets to the revolution of modern pain science, the ability to predict rehabilitation time lines, and for identifying individuals prone to exaggerated pain perception or with a high likelihood of developing chronic pain. While the fear-avoidance model definitely isn't brand new, this is an exciting study because it sets the groundwork to develop an FABQ equivalent for athletes. Specifically, the FABQ was developed, validated, and used for a general population. Despite it's success and the success of other items like the PCS when dealing with athletes...it is NOT a perfect fit for use in an athletic population. I personally gave the FABQ to several athletes on several occasions and they would often become confused and disgruntled with the "work" related questions. This is where the AFAQ or Athlete Fear Avoidance Questionnaire could potentially come in handy. 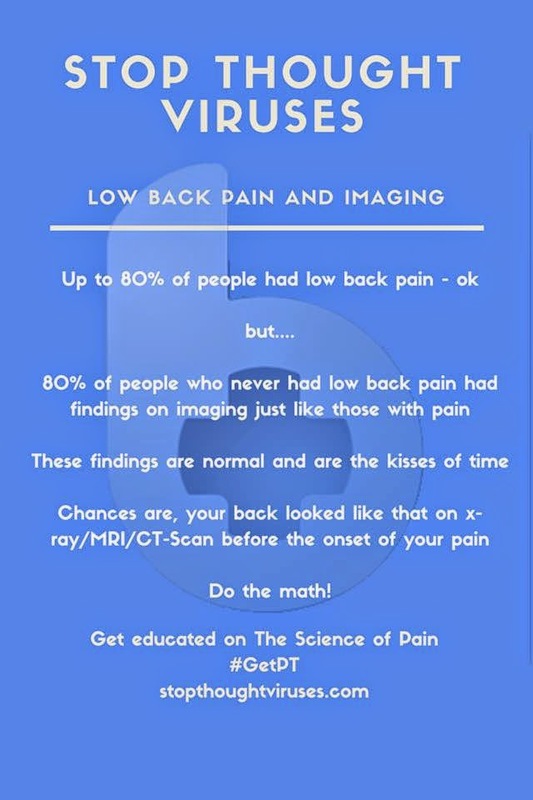 Do you educate your patients on pain science? Are you even aware of the benefits of doing so? The authors of this study assembled a squad of "experts" such as medical personal, sports psychologists, and sport coaches to develop a questionnaire using education on the fear-avoidance model, statistical methods developed for the creation of questionnaires, and the experience of the panel and their interaction with athletes and injuries. The authors then took the AFAQ which underwent many revisions to its question and the scale system used for points until they were satisfied. Afterwords, they took the questionnaire and gave it to a variety of athletes (some healthy but previously injured and some with current injuries) to determine the correlation and thus validity of the new questionnaire compared with the previous but different FABQ and PCS questionnaires. Here is the finalized AFAQ, courtesy of the Journal of Athletic Training. The authors were able to establish based upon their results that they had developed a questionnaire with both good internal and external validity, and that they had concurrent validity with both the FABQ (r=.352,p&lt;.005) and the PCS (r=.587,p&lt;.001). However, there was not a significant correlation between the work version of the FABQ (FABQ-W, r=.137, p=.176). This insignificance highlights the need for something like the AFAQ because it was hypothesized that the "work" related questions did not correlate or work well at all for athletes. What should the take home point be? "The AFAQ is a scale that measures injury–related fear avoidance in athletes. This scale could be used by sports medicine professionals, including athletic therapists and athletic trainers, as an extra rehabilitation tool to identify fear avoidance in athletes as a potential negative psychological barrier to rehabilitation. Fear-avoidance scales for the general population have already been used to predict return to work and the development of chronic pain. Similarly, identifying athletes with high levels of fear avoidance using a sport-specific scale could allow clinicians to address this psychological barrier early in rehabilitation and potentially reduce the time until return to play." One last thing, in the discussion the authors are quick to take note but I wanted to make sure you all took this point home with you too before running off to use the AFAQ. This was an initial study that solely developed this new questionnaire and established it's validity with reference to the pre-existing FABQ and PCS. There is still additional research needed on the AFAQ to see if it truly can be as essential and predictive as the aforementioned tools for the general population. Considering the positive correlations we can feel confident that it may but as always...we need some real evidence to be sure! However, pain science isn't just something for our "zebra" patients and is something that can be applied to everyone and that is why this is exciting. Being able to quantify emotions and beliefs related to pain and then educate our patients is a great step in the right direction for us to truly help them.